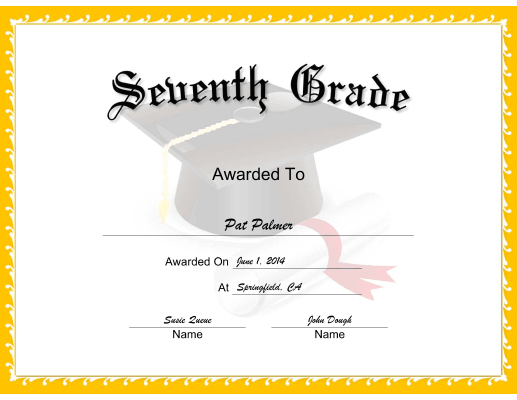 This Mortarboard Grade 7 Certificate features a mortarboard, tassel, and rolled diploma tied with a red ribbon wrapped in a yellow border. 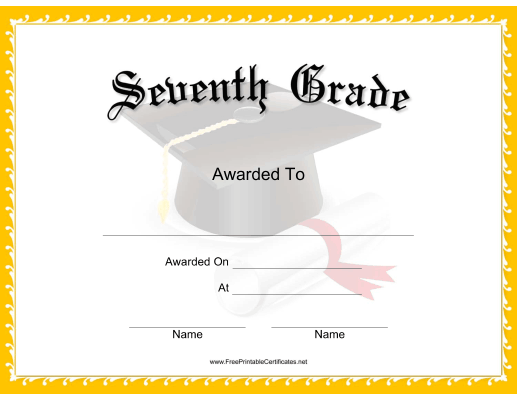 This certificate is available in two versions: a free, ready-to-use version and a $5.00 version that you can customize. The $5 version is available in Microsoft Word (.DOC) format: Just download it, open it in Word (or another word processor that's compatible with the DOC file format), and customize it before printing. You can pay using your PayPal account or credit card. You'll be able to download the customizable certificate within moments. If you don't see a certificate design or category that you want, please take a moment to let us know what you are looking for.